Last Sunday was my Food Bloggers Los Angeles (FBLA) meeting for October, which I was fully planning to attend. And then my life went sideways, you know what I mean, and I couldn’t make it. 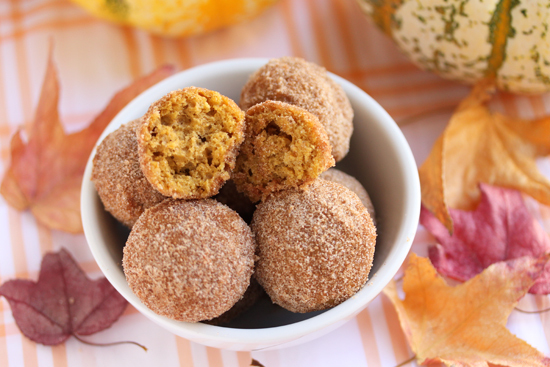 I made these Cinnamon-Sugared Pumpkin Donut Holes and they were ready to go. Everyone was bringing a dish with pumpkin and I was really looking forward to it. Oh well. You can see a really nice write-up about this meeting on Shockingly Delicious (Thanks Dorothy!) and there are links at the bottom of her post with many pumpkin recipes from our FBLA members. I hope you enjoy them. 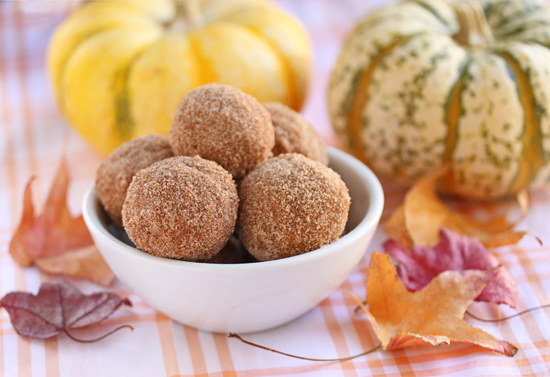 These little morsels are actually mini-muffins, but after being rolled in melted butter and the cinnamon-sugar mixture, they really are like donut holes. 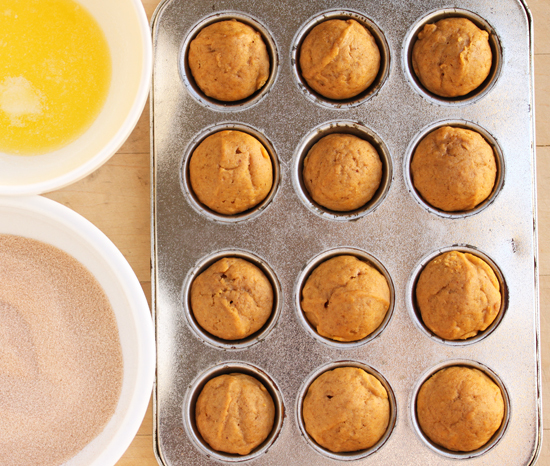 The muffins are flavored with the wonderful pumpkin pie spices, cinnamon, nutmeg, allspice and cloves and when you bite into them you are transported to a little bit of pumpkin pie heaven. 1. Preheat oven to 350 degrees F. Spray two 12-cup mini muffin tins with nonstick spray and place on baking sheet side by side. 1. In a large bowl, whisk together oil, brown sugar, egg, vanilla, pumpkin and milk until smooth. 2. In a medium bowl, whisk together flour, baking powder, salt, cinnamon, nutmeg, allspice and cloves. 3. Add the dry ingredients to the egg mixture and stir until just combined. Do not over mix. 4. Fill the muffin tin cups 3/4 full, about 1 tablespoon in each. I used a 1-1/4-inch ice cream scoop. 5. Bake 10 to 12 minutes. A toothpick should come out clean. 6. Melt butter in medium bowl in microwave. Mix sugar and cinnamon in another medium bowl. 7. When muffins are cool enough to handle, dip several in butter to coat and toss in cinnamon-sugar mixture. Eat and enjoy. Note: Pumpkin muffins can be made ahead and frozen. Bring to room temperature, uncovered, then coat with butter and cinnamon-sugar mixture. We missed you at the meeting… and we missed eating those amazing looking donut holes!! Gorgeous and inspiring as always Lynne. Look forward to seeing you at the next FBLA event. Uh oh. Donuts are (were, anyway) my weakness, and these are making me lust (I hope no one catches me). Gluten-free, shmuten-free. I want the real deal!